Yarn Is My Métier: Book 'em, Franklin! I am in luff with this man's intellect, twisted wit and emotional clarity. Yes, I could gobble him up because he's beyond adorable but that's beside the point. Today is the day for titters, tee-hees, guffaws and outright belly laughs, courtesy of one Franklin Habit. Franklin continues the book tour in support of his just-released collection of sketches and short essays entitled, "It itches." This is a little book (only 6" x 6") with lots of humor and heart. It perfectly captures the oddities, foibles and sometimes obsessive nature of our fibery pursuits in a way that only Franklin can. Although this is his first book, Franklin has been making us laugh for some time now as he chronicles the exploits of an imaginary cast of characters, including a saucy sheep named Dolores and Harry, the often gullible skein of yarn. While the book features neither of this well-known duo, there is an amazing thread of fiber humor that keeps you turning the pages. My current favorite is a re-imagining of conversations and thoughts of historic figures as knitters. Marcel DuChamp. A megaphone and boa constrictor. Ha! Great picture of the two of you! Hopefully he wanders through town again sometime - he was here for the 1000 Knitters project earlier this year. Nice photo! Isn't Franklin the best? Let's hear it for Chicago knitbloggers! I'm looking forward to this book. Unfortunately, despite being a bookish town, I don't think Seattle's on his tour schedule. And I adore Franklin...got his book last weekend, but alas, Franklin was not around to autograph it. 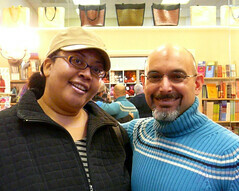 What a terrific photo of two of my favorite bloggers! I adore Franklin...got his book last weekend. You sure had a great time. I've seen lots of posts about Franklin. Great picture of the two of you. I was lucky enough to receive an autographed copy from Lynette. I've been enjoying it while eating breakfast. It's a nice way to start the day. Some day I'll get to meet him! lovely photo of the two of you! i can only hope he decided to meander down this way. i kind of doubt it though. I am so going to check out his book! You know I love to get a good giggle. Great photo! I got this book from my Mom for my birthday, and I enjoyed it immensely. I appreciate good cartooning; it is much, much harder than it looks, and Franklin Habit is very good. Awesome picture of you and Franklin. It sounds like it was a fun day. I wish he'd come out west!